PTScientists' Autonomous Landing and Navigation Module, or ALINA, lunar lander. 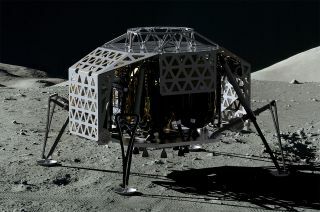 The German company PT Scientists, short for Part-Time Scientists, which originally competed for the Google Lunar X Prize race to the moon, plans to send a lander with a rover in late 2018 to visit the landing site of Apollo 17. (Launched in 1972, this was NASA's final Apollo mission to the moon.) Instead of using a complex dedicated telecommunication system to relay data from the rover to the Earth, the company will rely on LTE technology — the same system used on Earth for mobile phone communications. "We are cooperating with Vodafone in order to provide LTE base stations on the moon," Karsten Becker, who heads embedded electronics development and integration for the startup, told Space.com. "What we are aiming to do is to provide commercial service to bring goods to the moon and also to provide services on the surface of the moon," Becker added. "We will soft-land on the moon and disembark our two rovers, the Audi lunar quattro rovers, with which we are going to drive up to Apollo 17," Becker said. "The two rovers are essentially mobile phones that will communicate our video stream to Alina, which serves as an LTE base station, and Alina will communicate the data to us," he said. The two rovers, which appeared in this year's "Alien: Covenant" film, will examine in detail the Apollo 17 spacecraft to see what has happened to it in its 45 years on the lunar surface. "Using the LTE modem to transmit our data is much more energy efficient than using direct Earth communication," Becker explained. The rover gets 90 watts of energy from its solar panel, half of which goes to driving, Becker said; previously, the other half would have to go to the modem for communicating directly to Earth. "With LTE, it's significantly less," he said. Additionally, relaying data via the base station rather than directly to Earth solves difficulties with pointing the rover's antenna in the rough lunar terrain, Becker said. He said PT Scientists does not expect Alina and the rovers to survive the lunar night because of the extreme low temperatures. However, the experience gained during the first mission will be used in subsequent missions that will aim to establish a permanent telecommunication infrastructure on the moon's surface, he said. "We are trying to show that you can use the most widespread means of communication, which is the mobile network and particularly the LTE network, on the surface of the moon, to execute missions there," said Becker. "We are aiming to provide cost-effective solutions to problems that are arising in terms of building the lunar village." According to Becker, PT Scientists plans to conduct a second mission around 2020 that would carry LTE terminals designed to survive in the harsh lunar environment for extended periods of time. The company is closely cooperating with the European Space Agency, which has proposed a lunar village concept that would lead to permanent human presence on the surface of the moon. The agency's plan would let all nations and entities contribute to the overall operations with their unique skills and expertise. The Alina spacecraft can carry up to 100 kilograms (220 lbs.) of payload. During its first mission, the craft will carry three customer payloads, including an experiment designed by NASA Ames.